We carry out a Carpet repair service in Kingsbridge TQ7 and carpet stretching for carpets that need to be tightened or for carpet maintenance. We offer Carpet advice and tips in Kingsbridge TQ7. We also fit Vinyl and safety flooring. Get a FREE Estimate! Tamar Carpet Fitters offer services for Carpet Fitting within Plymouth, Cornwall and Devon. 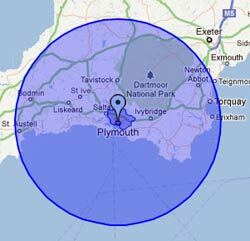 We Cover the circled area of Devon and Cornwall. We can do outside the circled area for larger jobs. There is no charge for travelling within South East Cornwall and South West Devon. Out side of this area there may be a small charge. We will inform you before booking a carpet fitter. Carpet Fitters Plymouth will fit any carpet you require at a great price guaranteed. Copyright to Carpet-Fitter-Plymouth.co.uk 2018. All Rights Reserved Tamar Solutions.